2019 Tax Season has begun! 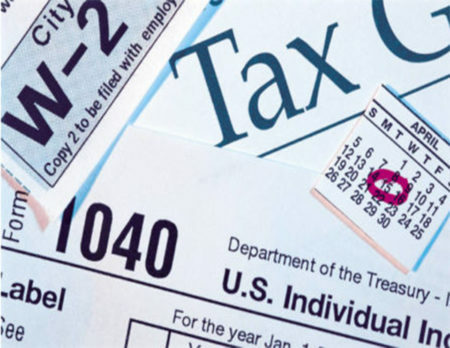 According to New York State, “Filing season for personal income tax opens January 28, 2019!” [exclamation point in original]. Judging by the number of people wearing green eyeshades and sleeve gaiters who began asking for the tax forms before Christmas, Larchmont is ready. At the Library we are almost as ready as we can be. We were sent 560 copies of the Form 1040 Instructions and a similar number of packets containing Form 1040 and Schedules 1-5. Please note that Forms 1040a and 1040ez have been reformed out of existence and only the simplified 1040 remains. Also, the numbered schedules don’t replace the good, old, lettered Schedules of yore. You still need the lettered ones to fill out the numbered ones, but the government didn’t send us any. New York forms and instructions are due to arrive by mid-February. You don’t have to wait for the paper forms to be sent here, however. IRS forms can be downloaded from https://www.irs.gov/forms-instructions. New York forms are available at https://www.tax.ny.gov/forms/. If you want to have Federal forms mailed to you, go here, choose the forms you want and give them your address. It should work but the shutdown might affect on-time delivery. For those who need help, AARP’s Tax Aide program starts February 1 and runs through to April 15. There are 20 locations throughout the County. Locally, you can stop by the New Rochelle Public Library on Tuesdays and Thursdays between 12 and 3pm. Mamaroneck Public Library hosts the service on Fridays from 10am to 2:30pm. If your income is under $55,000 or you otherwise qualify, you can get help through the IRS’s VITA (Volunteer Income Tax Assistance) and TCE (Tax Counseling for the Elderly) programs. There are locations throughout the County. If you are going to use one of the Library’s computers to prepare and/or submit your forms, be aware that although we do what we can to ensure their security, we cannot guarantee it. The Library’s wifi is public and therefore not secure. That said, if you are going to use one of our machines, let the librarian at the Information Desk know. If it is not too busy, he or she will extend your session so you won’t be logged off mid-form. Speaking of librarians at the Information Desk, it is in our nature to try to help people find out the information they need. However, we are not accountants. We do not understand tax law and do not profess to do so. It is actually unethical for us to offer tax advice. So, while we can help you find Form XYZ, we cannot tell you if Form XYZ is the right form once we find it.